I saw that Vegan Dad had some delicious-looking breads on his site, so I wanted to try them. Let me tell you about vegan dad. I like Vegan Dad. He's apparently probably Vegan, and probably also a dad. I don't see as many male vegan bloggers, so it makes me happy. I love to see people taking real concern in their kids' lives/nutrition. Sometimes people forget how much love can be put into the meals they eat. I like the fact that he has good recipes, I like his pictures, and I like that most of the food he makes is kid-friendly. Go, Vegan Dad! I'm not a baked goods purist, or any other type of purist for that matter. I like some chunky stuff. I like chunky stuff in my ice cream, I like chunky stuff in my soup. I like chunky stuff in my brownies. Give me texture! 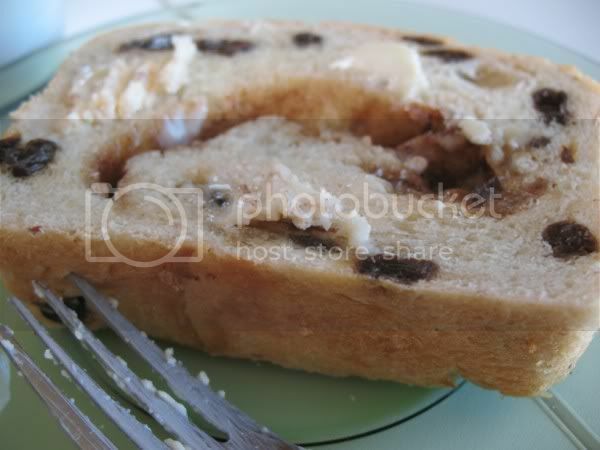 The cinnamon raisin bread is just slightly modified, and I decided to make the other one Italian garlic swirl. I would suggest not halving this recipe even though it makes 2 loaves. Just stick one in the freezer/give it away as a gift. You think your neighbor won't enjoy a nice loaf of bread? You are going to be waiting the same amount of time anyway, and 2 loaves is barely more work than 1. Other ideas for filling include mixed chopped olives, chocolate chips, other spices besides Italian (maybe cardamom, curry spice, jerk rub..Chinese 5-spice powder, even? ), maybe pumpkin seeds. 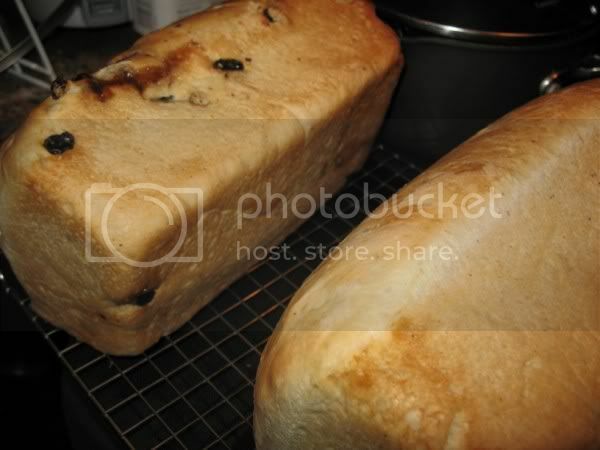 Maybe poppy or sesame seeds on top, sunflower seeds throughout, maybe even jam or jelly inside. Stir 3/4 tsp sugar into 1/3 c water. Mix in yeast and set aside until foamy. Mix together 2 cups water, sugar, salt, vinegar, flax mixture, and oil in a large bowl. Mix in yeast mixture and 2 cups of flour. Beat until smooth. Can use paddle attachment on a stand mixer. 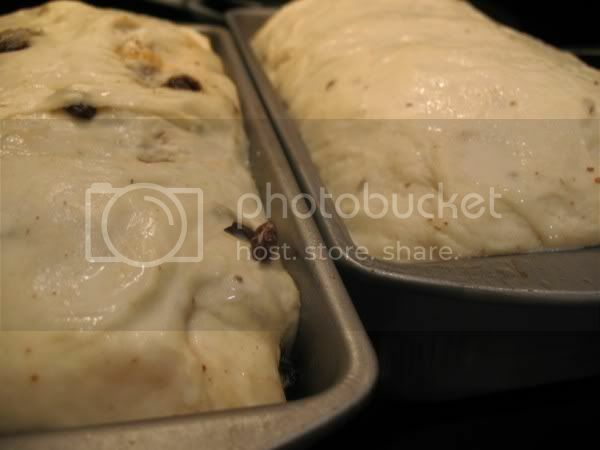 Punch down risen dough and knead for a minute or so to get out the air bubbles. 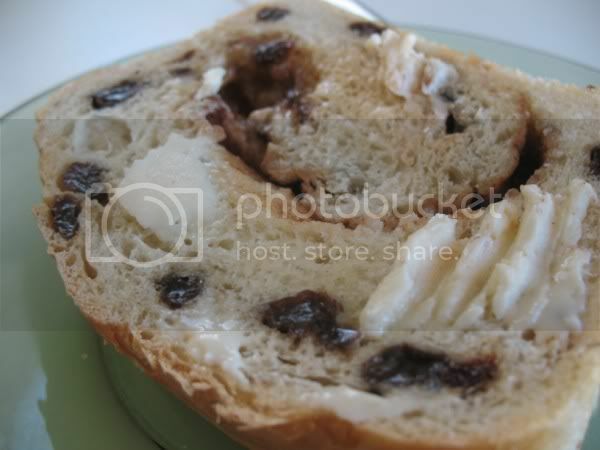 Separate dough into 2 balls and gently fold raisins into one of the dough balls. Roll out each ball into a rectangle, making sure it will fit your loaf pans. Spray loaf pans with nonstick spray. For cinnamon/raisin: Mix brown sugar, softened margarine, and cinnamon and spread the paste all over the rectangle. 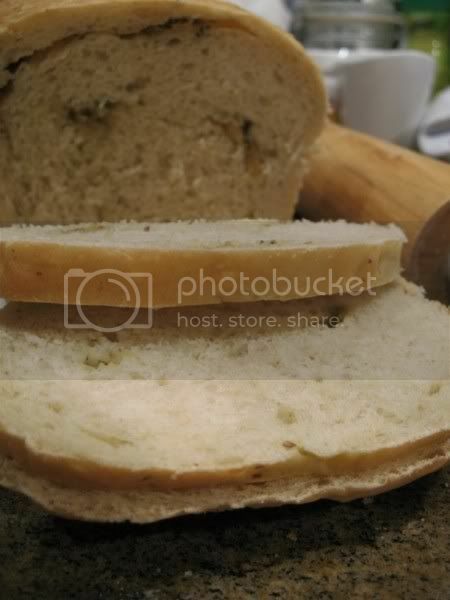 Roll up tightly, tuck edges in, and place in a loaf pan, "seam" side down. Let rise for 45 minutes, uncovered. (Once again, I do this in the turned-off oven). Preheat oven to 375 degrees. (Don't leave your bread in there, duh). Place loaves in oven and bake for 35-40 minutes, until loaves are nicely browned and sound hollow when you knock on the bottom. You can brush on some soy milk or oil before baking for more color, but it's not necessary. Let cool slightly and remove bread onto racks to finish, and make sure to "test" a slice (or 2!) while they are still nice and warm. We will be making a roasted garlic flavored paste. While bread is rising the first time, Peel garlic cloves and place in a heated pan with a couple Tbsp. olive oil. You want the pan on the lowest setting possible. We are not trying to saute or sear the garlic. Cover pan and shake every so often. When garlic is soft and a golden color, pour (with oil) into a bowl, add a pinch of Rosemary, generous shaking of Italian seasoning, and and a little shake of garlic powder. Mash into a paste with a fork. You can also use fresh chopped herbs. Proceed as with cinnamon bread. If your yeast mixture does not get foamy, your yeast is dead. Get some new yeast. It could have been age, temperature of the water, or just your bad attitude that killed it. Just kidding. Make sure the water is warm and not hot, because this can kill yeast. And another thing- yeast isn't an animal. So next time a non-vegan Dexter (or your grandma- she's just trying to help!) tells you that yeast isn't vegan, tell them that it's from the kingdom of Fungi and that we can (ethically) eat everyone in the kingdom of Fungi, even though we certainly wouldn't want to eat ALL fungi. 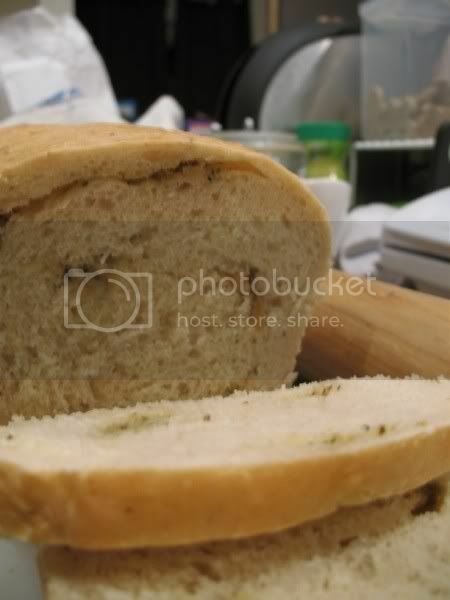 Both breads look über yummy! Your Swirly Bread is beautiful! I love it.